The self catering lodge can accommodate up to 14 guests, children stay for free. Perfect for nature lovers, and understated luxury, we have 3 Luxury rooms, 2 Family rooms and an outdoor lapa with a fully equipped kitchen. Located 1km from the self catering lodge. Experience a tranquil and private bush camp between two mountains with a beautiful view. The luxury bush camp can accommodate up to 10 guests. Hour long outrides in the early morning and sunset evenings. Before a ride we give you a quick training session on safety and how to ride. No running for beginners. Safety is our top priority, both to horses and guests. Morning and sunset game drives throughout the reserve, 2 times a day. At an extra cost we can arrange breakfasts or pick-nicks on game drives. Make everlasting memories on our private game reserve. Safety is our number one priority. Romantic or private sunset pick nicks on the mountain or next to our tranquil river can be arranged at an additional cost. Walking trails are available on the reserve, stick to the trail and follow the signs. Want to know more about us? Would you like us to call you back? Want to know what the costs are? Need some directions to the reserve? Fill out a contact form today and we will get back to you as soon as possible. 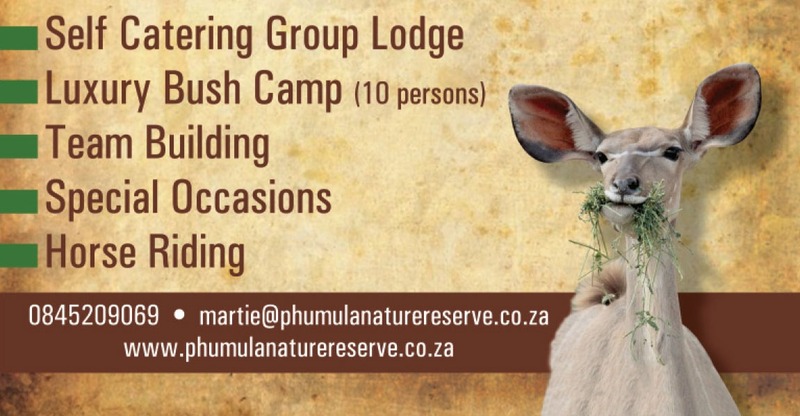 Phumula Private Nature Reserve offers a variety of camping experiences: from family-friendly developed self catering lodge, to popular backcountry sites, to the solitude of a Wilderness setting.